Habit: Perennial herb, generally rhizomed, of +- wet places. Leaf: simple, alternate; stipules generally fused to petiole. Inflorescence: spike [raceme], dense, many-flowered, generally terminal, subtended by involucre of petal-like bracts [or not], each flower generally subtended by 1 bract. Flower: small, bisexual; perianth 0; stamens 6(8), appearing to arise from inflorescence axis [or not]; ovary inferior [or superior], sunken into inflorescence axis [or not], compound, chamber generally 1 [or carpels fused only at base]; styles 3--4[5(7)], distinct. Fruit: capsule, +- fleshy, dehiscent near top [or mericarps]. Seed: [1 or] many, spheric or ovoid. Genera In Family: 5 genera, 7 species: eastern Asia, North America. Anemopsis californica (Nutt.) Hook. & Arn. Habit: Rhizome thick, woody. Stem: 8--80 cm, hollow, glabrous or hairy. 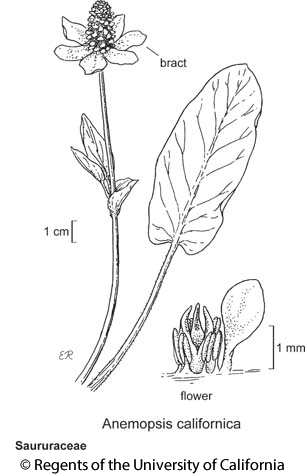 Leaf: basal several, blade 3--20 cm, elliptic to oblong, base cordate or not, petiole 2--40 cm; cauline < basal, 1--few, 1 ovate, generally subsessile to clasping, subtending 1--3 with short petioles or not. Inflorescence: 1--4 cm, conic; involucre bracts 4--9, 0.3--3.5 cm, petal-like, white, often tinged +- red; flower bracts 3.5--6 mm, +- spoon-shaped, white. Ecology: Common. Saline or alkaline soil, wet or moist areas, seeps, springs; Elevation: < 2000 m. Bioregional Distribution: CaRH, s SN, Teh(? ), sw ScV, SnJV, CW, SCo, ChI, WTR, SnGb(? ), SnBr(? ), PR, SNE, DMoj, DSon(? ); Distribution Outside California: to Oregon, Kansas, Texas, northwestern Mexico. Flowering Time: Mar--Sep Note: Plants aromatic, once used to treat diseases of skin, blood. Citation for this treatment: John W. Thieret & Elizabeth McClintock, final revision by Thomas J. Rosatti 2012, Anemopsis californica, in Jepson Flora Project (eds.) Jepson eFlora, http://ucjeps.berkeley.edu/eflora/eflora_display.php?tid=13392, accessed on April 19, 2019. CaRH, s SN, Teh(? ), sw ScV, SnJV, CW, SCo, ChI, WTR, SnGb(? ), SnBr(? ), PR, SNE, DMoj, DSon(? ); Markers link to CCH specimen records. Yellow markers indicate records that may provide evidence for eFlora range revision or may have georeferencing or identification issues. Purple markers indicate specimens collected from a garden, greenhouse, or other non-wild location.